Pork katsu, cucumber and avocado. California rolls covered with Unagi. Tempura prawn, cucumber, avocado and imitation crab. Two pieces of California rolls, 6 pieces of tuna and 6 pieces of cucumber rolls. *Consuming raw tuna may increase your risk of foodborne illness. 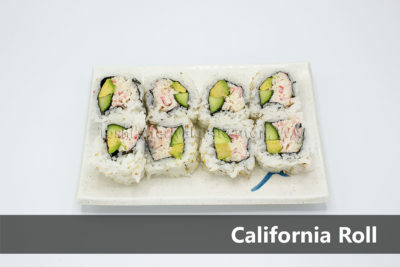 California rolls covered with cooked shrimp (Ebi). Cucumber, avocado and imitation crab. Raw tuna, rice and seaweed. *Consuming raw tuna may increase your risk of foodborne illness.